We recently launched a new feature that allows your riders to choose their own music to play through your car’s speakers during their trip. You already provide incredible service — this is just one more opportunity to make your riders even happier. 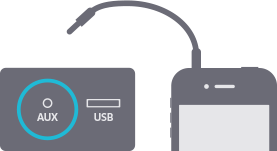 To get started, you need an AUX cable and the latest version of the driver app. Set your stereo to AUX and adjust your stereo volume to a reasonable level. Plug the AUX cable into both your stereo and driver iPhone. Listen for the test sound before proceeding. If you hear the test beat, go online. That’s it! You don’t need to do anything else. Once you begin the trip, any rider who has a music note next to their name can use their phone to control the music that plays through your car’s speakers. To learn more, please watch the video below. If you are having trouble getting the music to work, please read the FAQ below. What if I have an AUX port, but no AUX cable? Uber provides AUX cables in many cities, so reach out to your local Uber office to see where you can pick one up. These cables are inexpensive and can also be purchased online or at any local electronics store. I didn’t hear the test beat, or music in general is not working. What do I do? With the AUX cable plugged in, your iPhone’s volume level is set all the way up. If this all looks good, tap the music switch off and then back on again, and you should hear the test beat play over your car’s speakers. If so, go online and you should be all test. You do. We expect riders to be courteous with their music selections, but if a rider does request volume levels or plays music that make you uncomfortable, you can turn the volume down or off, so that you are not distracted while driving. You can always kindly ask riders to change their music as well. How do I know if a rider wants to play music? Once you accept the trip request, riders who have enabled this feature will have a musical note next to their name. If you did not enable music for this driving session, consider trying it out during your next session. I use my own device to run the Uber Partner App. How much data will music use? If you use the Uber Partner app on an Uber-provided phone, the data cost will be covered by the subscription fee. If you use the Uber Partner app on your own phone, the data use will go against your personal data plan and therefore may be an additional cost. Since this may impact your data plan cost as it gains more adoption, it’s good to remember that you have access to discounted phone plans with carriers like AT&T and Verizon, and we are in talks to expand these discounts in the coming months. We’re also working closely with wireless carriers to offer discounted (zero-rated) data plans that do not charge for music streaming. Again, enabling music for your riders is your choice. How will this affect turn-by-turn navigation? Voice navigation is not available when you have enabled music for a session. What if I don’t have an AUX port in my car? At this time, having an auxiliary port is the only way to connect music. We’re working to enable bluetooth and we’ll let you know when that becomes available. There are ways, though, to add AUX capabilities to your car. How do I disable music? 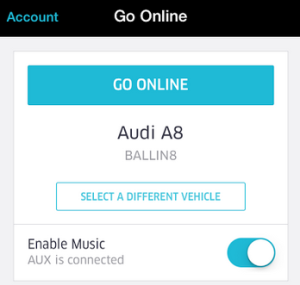 Before going online, uncheck the slider in the Uber Partner app or unplug your AUX cable. If you’re already online, you’ll need to go offline to disable music. Music still doesn’t seem to be working. What should I do? Check to make sure the two ends of the AUX cable are securely inserted into both your car port and the phone headphone port. Be sure that your stereo mode is set to AUX and that your stereo volume is turned up to a comfortable level. Make sure that your driver phone volume is at a normal level. Make sure you toggled “ Music” on before going on duty and heard the test beat. Rider Music is disabled on uberPOOL trips.